MIC-10 meter is designed to perform electrical tests, which establishes the safety of insulation in a systems. 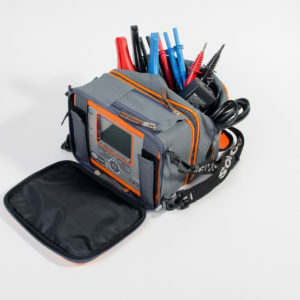 This is a very handy digital multimeter tool, measuring Insulation resistance up to 10GOhms with up to 1000V measuring in accordance with IEC61557-2. quick sound signal if circuit resistance is below 30Ω. Measurement of alternating and direct voltages in the 0...600 V range. Power supply: 4 AA disposable or rechargeable batteries, monitoring of power supply voltage. Meter conform to EN 61557. This insulation resistance meter has digital filters function for measurements in high noise environment. Continuity measurement of protective connections and equipotential bonding in accordance with EN 61557-4 with current > 200 mA. Adjustable limits for measured resistance RISO and RCONT. Measurement of leakage current during insulation resistance testing. DC and AC voltage measurement in the range of 0...750 V. Drawing graphs on the display during measurement. Innovative memory with possibility of description of: measurement points, facilities, names of customers. Operating with mini Bluetooth keyboard (option). MIC-10s1 - Stable measurements in noisy environments such as 765 kV substations. Graphic LCD 5,6'’ backlit. Keyboard backlit. Power supply from battery packs. Built-in fast charger. 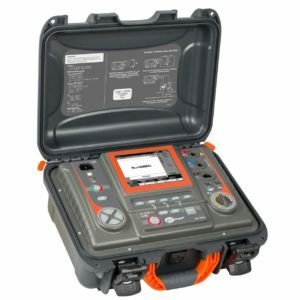 The instruments meet the requirements of the EN 61557 standard. This insulation resistance meter has digital filters function for measurements in high noise environment. Continuity measurement of protective connections and equipotential bonding in accordance with EN 61557-4 with current > 200 mA. Adjustable limits for measured resistance RISO and RCONT. Measurement of leakage current during insulation resistance testing. DC and AC voltage measurement in the range of 0...750 V. Drawing graphs on the display during measurement. Innovative memory with possibility of description of: measurement points, facilities, names of customers. Operating with mini Bluetooth keyboard (option). Graphic LCD 5,6'’ backlit. Keyboard backlit. Power supply from main power line or battery packs. Built-in fast charger. 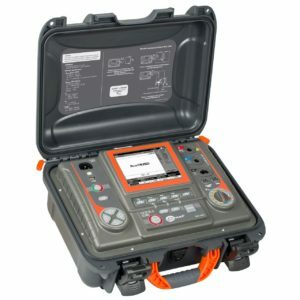 The instruments meet the requirements of the EN 61557 standard. 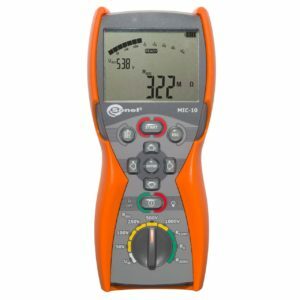 A very handy tool for measuring Insulation resistance with up to 2500V It can measure up to 1TOhms in accordance with IEC61557-2. Comes with confenient carry case with straps to free up your hands during operations. with the >200 mA current. Alternating and direct voltages in the 0...750 V range. Charge from car lighter (12 V) socket (additional accessories).